This article first appeared in Haven, The Edge Malaysia Weekly, on June 5, 2017 - June 11, 2017. 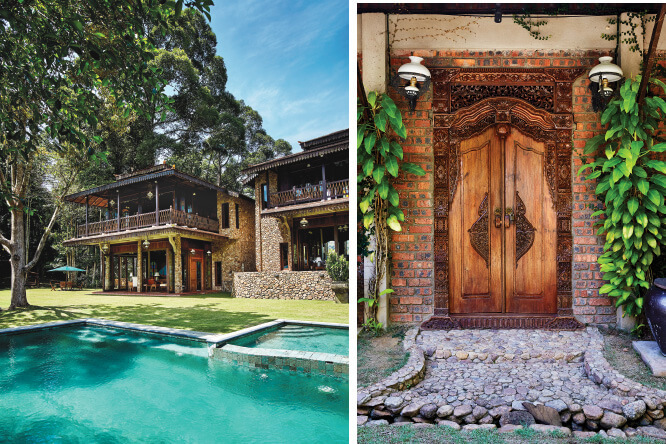 Deep in the heart of verdant Janda Baik, the sprawling Puncak Rimba estate remains Datuk A Shazilly Bakti’s ongoing, all-consuming passion project. 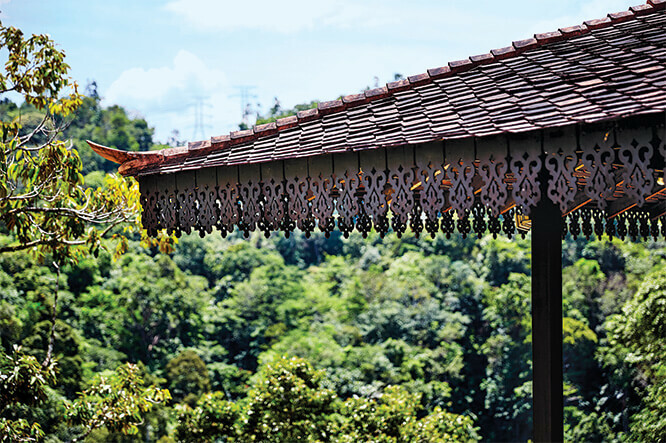 Ensconced amid the verdant jungles of Bentong, Pahang, is the charming hillside village of Janda Baik. With a bracing climate that is distinctly cooler than the Klang Valley’s stifling heat and humidity, Janda Baik — which is Bahasa Malaysia for “good widow” (or “merry widow”, if you have a penchant for Franz Lehar) — has become the weekend neighbourhood of choice for those who wish to be close to nature without venturing too far from the bright lights of the city. Sharing this sentiment is none other than Datuk A Shazilly Bakti, chairman of Schlumberger Drilling Services Sdn Bhd, whose sprawling Puncak Rimba estate is a true vision of an earthly paradise. 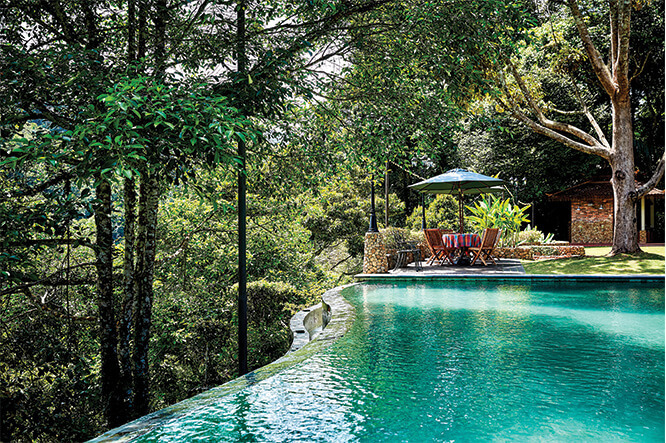 Set on 12 acres, Puncak Rimba is made up of a cluster of villas surrounded by forest and orchards. 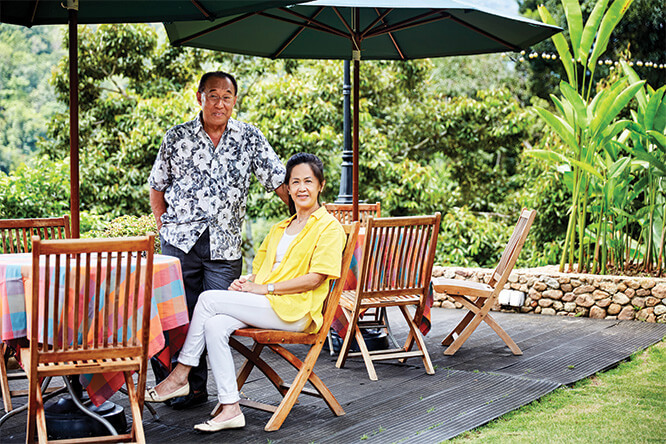 “Years ago, I bought a plot in Janda Baik without inspecting it,” Shazilly shares. “It was around the time when everyone was buying land here. So, I bought without looking and, unsurprisingly, it didn’t excite me. I had no inspiration to develop the plot and it was only just recently that I managed to sell it off. In my heart, I’d always wanted a place with undulating terrain, preferably with a stream. Then, I came across this piece of land for sale in the newspapers, and I visited it. It was perfect, meeting all my set criteria and had the bonus of a waterfall on site. I’d brought my family along to have a look and they all loved it too. So, we had to, how would you say, put on our poker faces when we started negotiating with the landowner,” he laughs. With the deal smoothly concluded about 12 years ago, Shazalli took his time. It was only five to six years ago that he finally began building his dream house ... or, to be more accurate, dream houses. 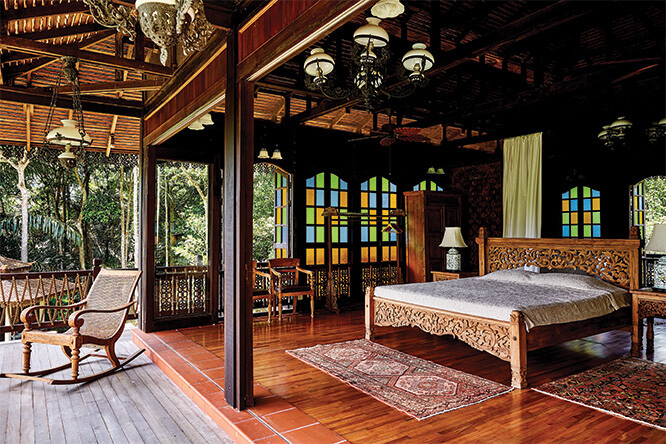 Seven individual villas dot Puncak Rimba, including a 106-year-old wooden house brought from Kampung Bongek, Negeri Sembilan. The decor, however, is a blend of all the aesthetics and design sensibilities of the Nusantara region, giving Puncak Rimba an eclectic yet visually-pleasing vibe. 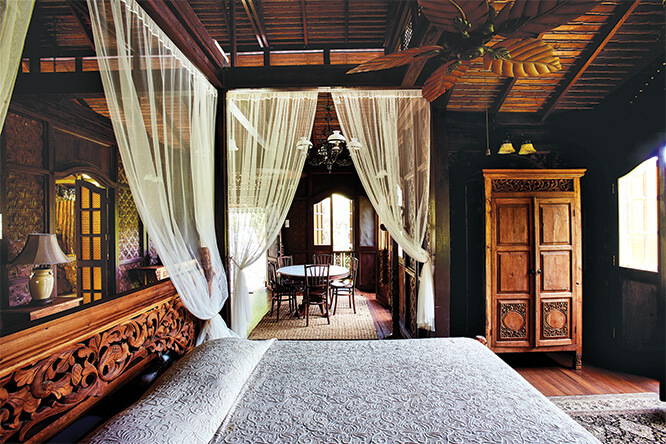 There is a mish-mash of decorative elements ranging from congkak boards and brass gongs to marvellous old-fashioned Dutch lamps and large pieces of bamboo furniture sourced personally during excursions to Solo and Borobudur in Java. 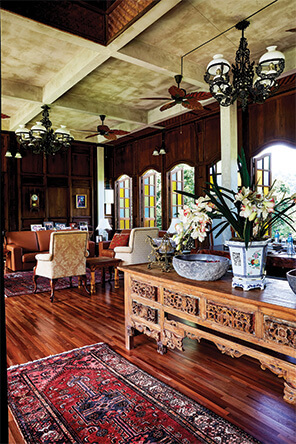 Stained Indian rosewood and high ceilings also feature heavily in the villas. “I love the feeling of space it gives, and it really allows air to circulate,” Shazilly says of the high ceilings. Those with an appreciation for detail would also admire, not just the fine Singgora tiles, but also traditional ukiran (carvings) known as ekor cicak (lizard’s tails) and finials called ekor itik (duck tails) hanging from and off the roofs. “I commissioned carvers from Rantau Panjang, the border town along Sungai Golok, to do these. Now, I can tell you, they are very happy whenever they see me coming,” he laughs. Indeed, as you explore the grounds, often encountering the resident ayam serama (jungle fowl), geese or ducks, you will find that Puncak Rimba offers a rhythm of life that is easy to fall in line with. Every few metres or so, you will come across a wakaf, most of which are complete with an inviting-looking day bed that beckons you to lie down for a postprandial snooze or simply to while the afternoon away with a good book. For the more athletically-inclined, a wooden deck made from old railway sleepers offers an ideal spot from which to plunge into river’s icy-cold waters. “Kids love using the smooth rocks as a natural slide,” Shazilly shares. His involvement in traditional Malay dance (he heads Pertubuhan Warisan Seni Tari & Muzik Melayu, a non-governmental organisation that works to preserve Malay dance) also shows in the provision of several grassy courtyards that double up as natural amphitheatres for performances or artistic gatherings. 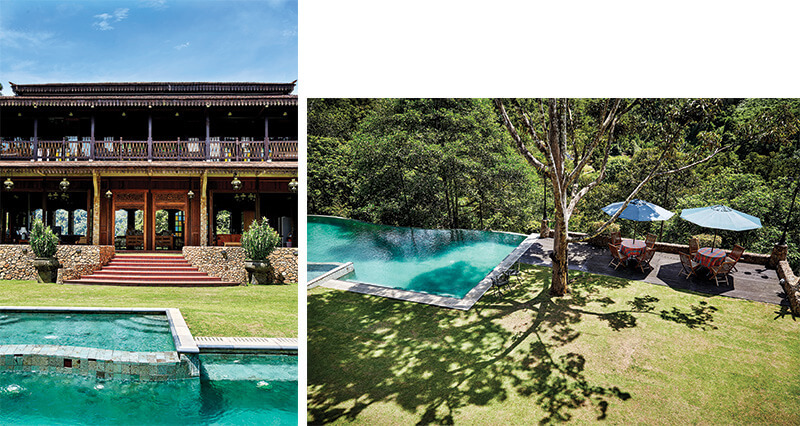 The main house, Villa Puncak, located at the estate’s highest point, is particularly lovely. Comprising three structures — two one-bedroom units flanking the two-bedroom primary villa — its lofty perch above a 100ft gully allows champagne-fresh winds from the Titiwangsa mountain range to regularly blow through the rooms, making them airy and blissful at all hours of the day. 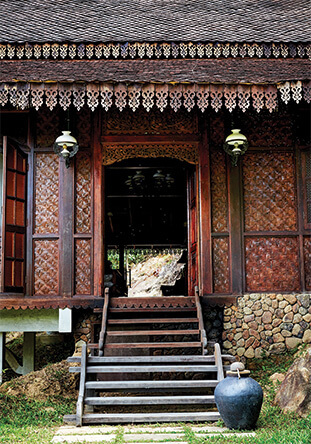 However, the most spectacular of all the houses is Rumah Lata a short buggy ride away. 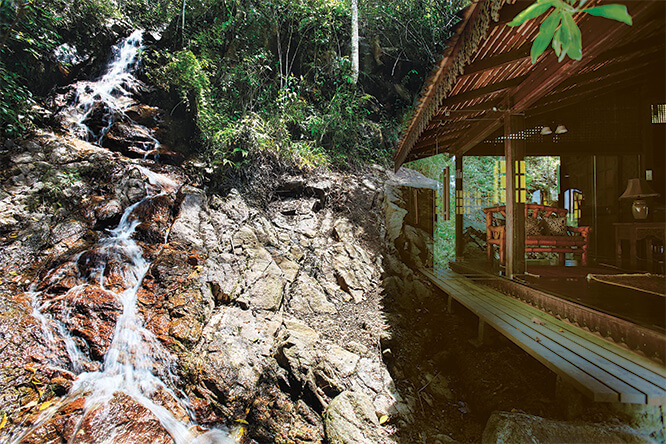 Lata, being the Bahasa Malaysia word for “waterfall”, should give you an inkling of what to expect but when you actually step into the villa, it is nothing short of breath-taking as you are greeted by the sight of a gushing waterfall right outside your living room. 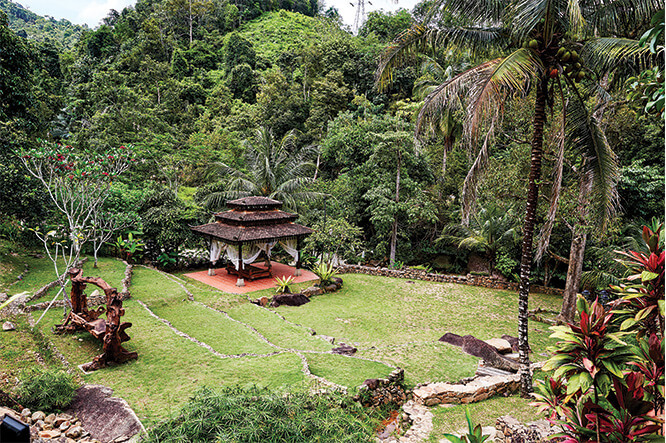 The great Frank Lloyd Wright may have designed the iconic Fallingwater but Rumah Lata has to be experienced to be believed and is, in our opinion, the pièce de résistance of Puncak Rimba. It exudes an energy that is all its own, yet affording peace, calm and the sense of Zen that only water can give, simply by being near it. Before (reluctantly) heading back to the city, we are invited to sit down to lunch and Shazilly’s wife, Datin Siti Kathrina Ahmad, has prepared a veritable feast, the highlight of which is a platter piled high with Raja Kunyit durians from the on-site orchard, to be eaten the Kelantanese way — using one’s hands and abetted by sinful glutinous rice, coconut milk, sugar and a pinch of salt — to bring out all the flavours. Villa life or not, it still sounds like a tropical re-telling of Enid Blyton’s The Enchanted Wood to us. The best part about Puncak Rimba? Fiction just got real.